In 2013, J.R. Willett unleashed the ICO concept — a fundraising system where companies sell their new cryptocurrency tokens in exchange for Bitcoin and Ether. Since Solomon vs Solomon ruling in 1896, segregating the liability of a person from the company, this ICO concept would be the biggest corporate structure innovation. Lets review the Good, Bad and Ugly of the ICO world. The willingness among the community to decentralize control, away from large corporations, and have all stakeholders aligned to work towards a common goal with the economic incentive. As a successful reference from the past, in open source movements like Wikipedia, Linux, crowdsourcing has worked well even without the economic incentive. ICO is the advanced sale of a platform’s crypto-currencies or tokens, to fund the development of fund raising company’s platform and product. These tokens can be easily sold and traded at anytime, on all crypto currency exchanges depending on their demand, providing liquidity to investors and vital early stage funding for entrepreneurs. These tokens are essentially the incentives, for several market participants to use and grow the platform in a decentralized manner. Such incentives are paramount in making a decentralized eco-system operate sustainably. 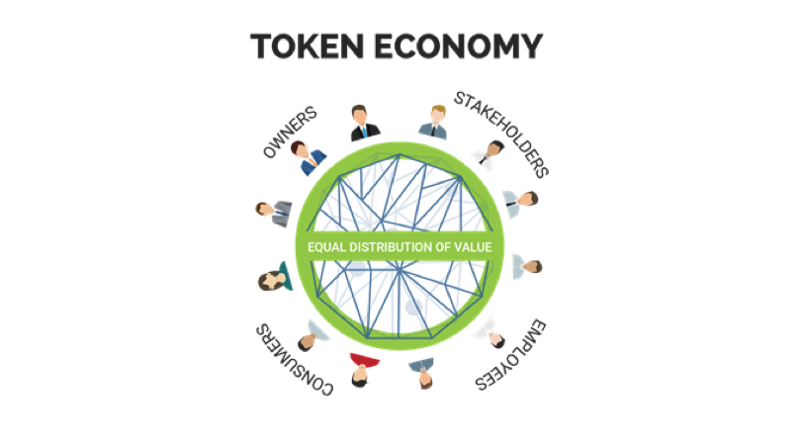 ICOs help blur the boundaries between stakeholders, leading to the Token economy as depicted below. Investors are participating very early on in the process, hoping to repeat the success of early stage Bitcoin investors who saw its value rise from a few cents to $5,000+ within 7 years, creating generational wealth for some investors. The surplus money people generated from early investments into crypto currencies are being re-invested into new crypto currencies. A genuine desire to fund some interesting causes and projects that are closer to the crypto-investors’ hearts. Limited liquidity (supply) of tokens means that as the use of token and platform grows, the value of tokens should grow as well, generating strong returns for the early-stage crypto-investors. ICOs are also beneficial to smaller investors as early stage crypto-investments are not limited to private investors or VCs, anyone can take part in a token sale, similar to the concept of Kickstarter, where people fund or support projects which they feel would be successful and effective. Do they have an MVP (minimum viable product), and team, and clients / users? This should help one differentiate from idea stage investing versus business scale up investing? How “all in” is the team behind the ICO. Are they investing themselves? And locked in for returns in form of tokens? How will the company use the funds in building / scaling their business / project? Are the tokens integral to platform’s success? This lead to not well analyzed investments, and failures later. Cryptocurrency news site Bitcoin.com has surveyed last year’s ICOs and found that of 902 tracked by TokenData, 142 failed before raising funding, and another 276 failed after fundraising, whereas another 113 projects “semi-failed,” because their teams have gone off the radar or their community has withered away. That jumps the failure rate to 59%. Many ICOs have ended up in litigations too. ICO project founders focussed on attracting investors, and not enough on the underlying project or the security of the ICO platform. The projects were either created for the sake of raising money, or completely blue sky, or just plaigirised from existing ideas. Hackers successfully take advantage — the more hyped and large-scale the ICO, the more attractive it is for attacks. Putting a number on that amount, we’re talking $400 mln stolen by hackers. The smart contracts used to raise funds are themselves poorly coded. According to Fortune magazine, up to 10 percent of all the money raised by ICOs between 2015 and 2017 was either lost in the crypto ether or stolen in hacks. These celebrities endorsed ICO in exchange of Hefty amount of money and ignore a major aspect of the project such as its viability and legitimacy. Besides celebrities, several entrepreneurs, corporate guys, became wannabe “ICO Advisors” and lent their profiles for ICO projects, in return for ICO tokens and other fiat / crypto currencies. This helped project a better image of the ICO project, and sort of mislead the retail investors. Not just retail investors, even Venture Capital firms got into the hype and invested millions of dollars into several ICOs, which did not lead to anything substantial. Besides, the corporate ownership of the ICO platform / project / company, still belongs to the shareholders, and not the token holders yet. Token prices were based on high random “finger in the air” valuation created by the ICO founders. Anybody could launch 100 million, or 10 billion tokens, and price them at $1 and discount it back with up to 70%. Its unbelievable how retail crypto investors psychology worked and they bought many such tokens. Some people even borrowed money to invest in cryptos in second half of 2017. There was no fundamental valuation of the project, no discounted cash valuation model with appropriate startup discount rate applied. Several average team ideas were priced at $100m or more. Investors fall for jargon and speculative mumbo jumbo. As a result such high-risk ICOs bank on investors fear of missing out (FOMO). Crypto issuance finds itself in a grey area of regulation. This is the biggest issue in terms of avoiding scam ICOs. Some jurisdictions like US are more advanced in classifying certain tokens as securities or utility tokens, in order to regulate them better. But most other jurisdictions like Korea etc. had been allowing for any ICO to happen. The risks of ICO and cryptocurrency investment are so high, that they warrant double warnings from governments including including Singapore, the UK, Iran, Germany and Ukraine.The Securities and Exchange Commission (SEC) has enforced actions against ICOs believed to be related to fraud. It is alleged that the tokens sold to US investors during Tezos’ ICO were actually securities.Tezos raised a record-breaking $232 mln during its Initial Coin Offering (ICO) in July 2017. The project has since been a subject of scrutiny and multiple lawsuits over the question of its compliance with the U.S. Securities and Exchange Commission (SEC) regulations, among other things. Since the company has not registered them with the SEC, this would constitute securities fraud. One obvious way that ICOs can achieve their full potential is if they get lightly regulated. This should not be confused with Blockchain, that is meant to be decentralised and not regulated; ICO is the fund raising process, which needs “some” regulation to make it “safer”. Easiest process would be to apply similar to Crowdfunding guidelines in UK or US, and the ICO platforms that help raise ICO funds to be regulated like Seedrs, for instance. Some jurisdictions have started the regulatory process. – In Switzerland, FINMA introduced new guidelines on ICOs, each falling within one or more categories: payment, asset, utility. – In Spain, the People’s Party is preparing legislation including possible tax breaks for companies using blockchain technology. – Gibraltar, Estonia and Japan are among few countries that have also simplified / allowed for ICO fund raising.